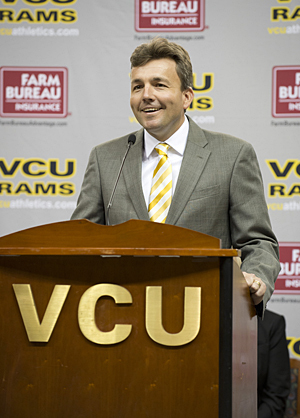 RICHMOND, Va. – Niagara’s Ed McLaughlin was introduced as the sixth athletic director in VCU Athletics history Tuesday. He succeeds Norwood Teague, who had held the post since 2006, but recently took the same job at the University of Minnesota. Ed McLaughlin isn’t afraid to dream big or make bold statements, laying out his vision for the athletics department Tuesday. You have the ability here to take a success story and make it something incredibly special. There are a lot of people in this business, a lot of ADs that take jobs, but not a lot of them can say when they wake up, ‘We can win a national championship here.’ It’s inspiring, and I think VCU is a place where we can win a national championship. Obviously the level of success that some of our programs have had demonstrates that. That’s what excites me the most, the chance to do something incredibly special. McLaughlin will have to hit the ground running when he officially begins work at VCU in about three weeks. He’ll walk into a leadership vacuum at 1200 West Broad. Interim Athletic Director Dave Benedict and Deputy Athletic Director Mike Ellis decided to follow Teague to Minnesota. 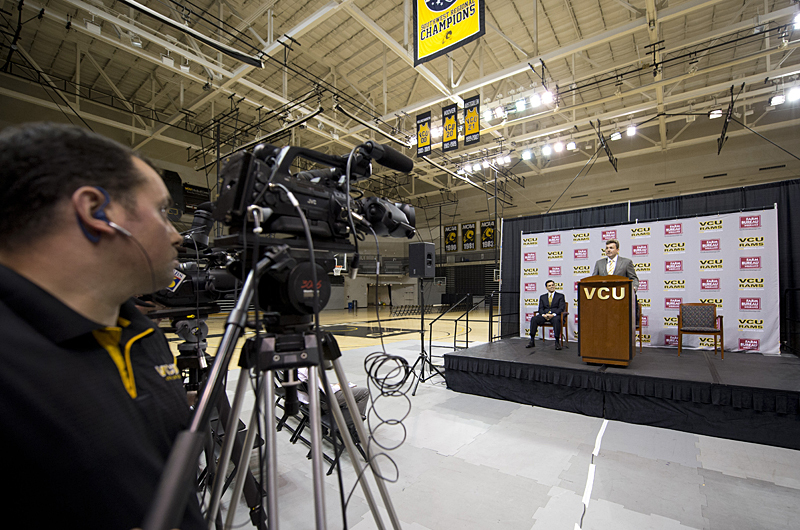 In addition, McLaughlin will have to begin to tackle VCU’s infrastructure needs, such as the basketball practice facility, currently in the fundraising stage. We have some immediate needs….my senior leadership team is going to be one of the first priorities. But as we look in our new place in the Atlantic 10, we have to make sure our student-athletes have everything they need, not only to compete, but to win championships. So, facilities will be a primary objective in my first little bit of time here, not only the big facilities, but the little things that student-athletes need. Really, the important part is me getting out and meeting people. And not only meeting people who are involved, but meeting some people who may not have been involved yet. That part’s going to be the most important, whether it’s meeting media folks or donors or corporate partners or meeting fans or whomever it is, I can’t wait to sit down and talk with recruits and talk about how wonderful a place this is. That’s the other important piece. You do all this to make sure you have the high-quality student athlete that comes in every year. Recent success in men’s basketball and other sports, as well as the school’s move to the Atlantic 10 Conference, have made VCU a much more attractive destination not only to recruits and coaches, but to administrators as well. If this were when I was leaving American University six years ago…VCU was starting to do things, but wasn’t nearly what it is now. This became a job people wanted. Not just folks coming up, but established athletic directors think this is a great job. When I looked at it, what they’ve been able to do in a short period of time has been amazing. So being able to be a part of that is going to be fun. Many Ram fans out there are wondering how McLaughlin will mesh with men’s basketball coach Shaka Smart. They’ll be happy to find out that the two men have known each other for several years. McLaughlin is a six-year veteran of the Villa 7 Coaches Consortium, which helped produce Smart. Smart was also a member of the search committee that selected McLaughlin for VCU Athletics’ top post. People have been asking what are you going to have to do to keep Shaka? I think it’s quite the opposite. 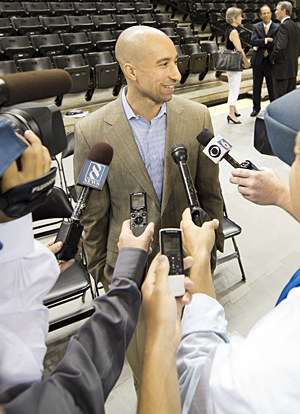 One of the people who sold me most on VCU was Shaka Smart. He understands what a wonderful place this is. He understands that there’s more for us to do. Shaka’s been one of the people who has certainly made me feel most comfortable coming here in how much he wants to be here. The first time I met him I knew he was going to be a superstar. He just has that energy. I don’t find a lot of people that have more energy than I do. But he’s got that energy and he’s got that personal touch too. Since it was bound to come up at some point, McLaughlin let it be known that he won’t run away from the inevitable football talk that floats around a couple of times a year. Sure, it’s one of the first questions I got asked. We have to make sure we have all the things we need for our current student-athletes and look our infrastructure and see what we need to do to improve what we’re currently doing. But I think it’s our obligation to have those conversations with Dr. Rao and the Board of Visitors just to make sure we’re playing all the right sports to support his vision of the university as a premier research institution. Shaka Smart was a member of the search committee that targeted Ed McLaughlin and appeared at Tuesday’s press conference to support VCU’s new athletic director. Smart was also at Tuesday’s introductory press conference. He felt that McLaughlin stood out during the interview process and expressed support for his new boss. Everyone did their part, everyone worked together, and at the end of the day, Ed was the unanimous choice of the search committee. You feel good when you get to that point because there’s not much discussion or debate. Everyone agrees. And when he came to campus and met with Dr. Rao, Dr. Rao made the final decision and we were excited to hear, as a search committee, that he felt the same way we did. It’s a huge relief on the part of everyone in the athletic department. When you don’t have a leader, it’s not the same. As Ed said, Norwood did a great job here, and his staff did a great job. There’s certainly been a void of leadership over the last two or three months, but Ed is here and that void will be filled and it will be more than filled. I know he’s up to the challenge and I know he’ll bring great people in here and we’re ready to roll up our sleeves and go to work with him. This has to bring a huge sigh of relief to VCU fans!